NOTE: This post is a summary of ongoing research being conducted to understand the potential meanings of bear at the Feltus site. Any suggestions of sources you have to expand this research would be greatly appreciated. The post is excerpted from a manuscript in preparation; please do not cite without permission of the author. During the Coles Creek period (AD 700—1200), people constructed four large earthen mounds at the Feltus site in Jefferson County, Mississippi. Before, during, and after the construction of these earthworks, Feltus served as a location for ritual gatherings characterized by communal feasts. As a part of the ceremonies associated with these feasts, standing posts were repeatedly set, pulled, and re-set. Archaeological investigations of these posts and related deposits have produced an astonishing amount of bear bone. Because of their association with ritual gatherings and the seemingly special treatment of their remains, it is hypothesized that bears were particularly important to the people who gathered at Feltus. This research strives to understand the origins and meaning of these beliefs and activities by exploring the breadth and depth of bear ceremonialism in North America and beyond. Four field seasons totaling nine months of fieldwork have been completed at Feltus since 2006. Ceramics and radiocarbon dates show three distinct phases of occupation (Figure 1). During the initial occupation of Feltus, Coles Creek people repeatedly set, pulled, and re-set large, standing posts in the southern end of the plaza. Though the exact use of these posts remains elusive, their unusual depositional process and artifactual contents indicate that they were ceremonial in function. 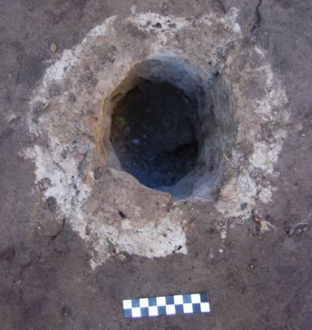 After the post was inserted, each posthole was packed with ash; the artifacts associated with this ash (e.g., tobacco pipes and bear bone) imply that it was likely a meaningful substance. 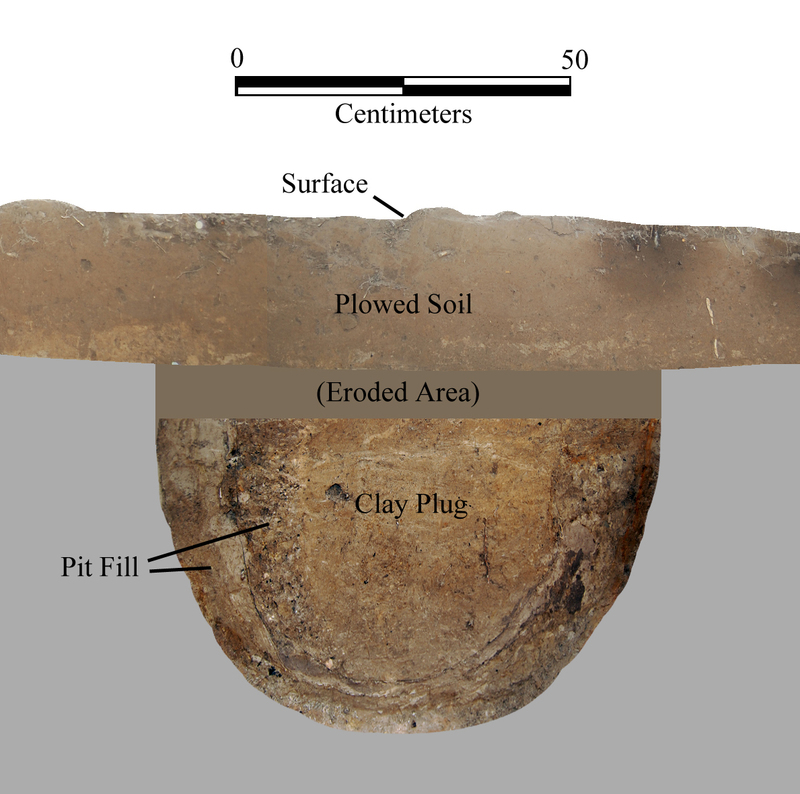 Each post was then removed and the post mold packed with clean brown clay (Figure 2). Near these posts, Coles Creek people dug three large pits, which they rapidly filled with ceramics and food remains (including bear bone which is rare or absent in many prehistoric faunal assemblages). The exceptional size of the vessels and sheer abundance of food remains suggest that a large-scale eating event, or feast, took place at Feltus between AD 700 and 800. 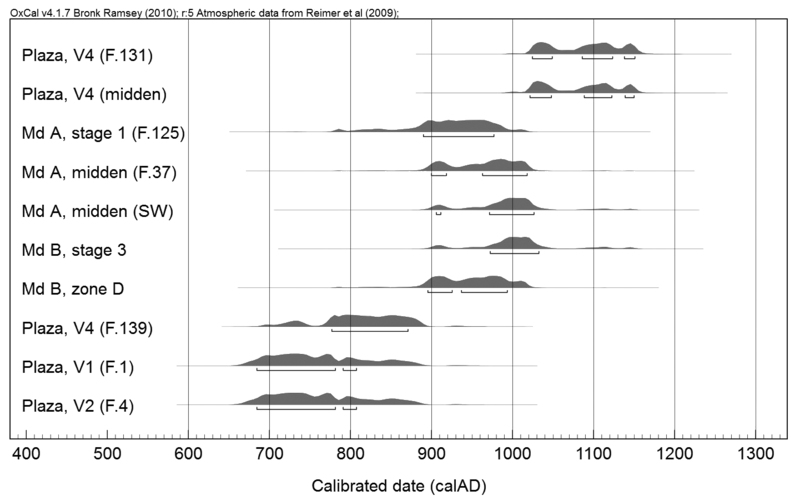 Figure 1: Radiocarbon dates from Feltus showing three distinct phases of occupation. Figure 2: Example profile of large, ash-lined post in the central plaza. After a hiatus of nearly a century, another feast occurred at the north end of the plaza, leaving behind a large midden. Again, this trash deposit contained an astonishing amount of bear bone. Moreover, an ash-lined post much like the ones in the south plaza was uncovered (Figures 3 and 4). It too was pulled and immediately after, the first stage of Mound A was built atop its empty hole. Once it began, moundbuilding became the primary focus of activity at Feltus from AD 900 to 1000. Although most mound construction ceased around AD 1000, the south plaza continued to be utilized until AD 1150. During this time, additional large posts were set and pulled in a continuation of the ritual activity that took place there during Feltus’s early occupation. 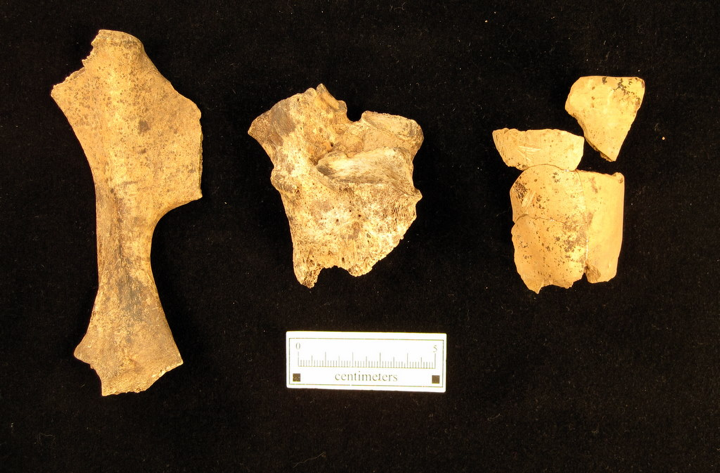 Figure 3: Deer pelvis, bear calcaneous, and ceramic pipe from a large post. Figure 4: Hollow, ash-lined post hole under Mound A. Archaeologists often focus on animals’ utilitarian and economic roles; however, the bear remains at Feltus beg a more symbolic interpretation. Since Paleolithic times, bears have been potent ritual symbols for peoples throughout Eurasia and North America (Black 1998:343). While stories always change based on context, the meaning of bear has stayed remarkably constant (Bieder 2006:172). “Many preagriculturalists saw the bear as a person, albeit a different-from-human person who possessed immense spiritual power” (Bieder 2006:163). This is likely because they share a great number of physical (e.g., bipedal gait, reproduction, binocular vision) and behavioral (e.g., omnivory, maternal relationship) traits with humans. Bears cry tears, they spank their children when they’re bad, they construct a dwelling, they eat the same foods in roughly the same proportions as humans—and even share our voracious sweet tooth (Hallowell 1926:148-152; Shepard and Sanders 1998:xi). Thus, as human-like animals, bears are thought to have the ability to link the human and spirit worlds; they are thus commonly seen as kin, as healers, and as food providers. Bear as kin. Perhaps because of the similarities mentioned above, many traditional origin myths claim descent from bears. Bears are often referred to as “grandmother”, “brother”, or “cousin” out of respect for that kinship (Hallowell 1926:43-49; Shepard and Sanders 1998:88-89). Even if direct descent is not claimed, humans often share family relationships with bears. 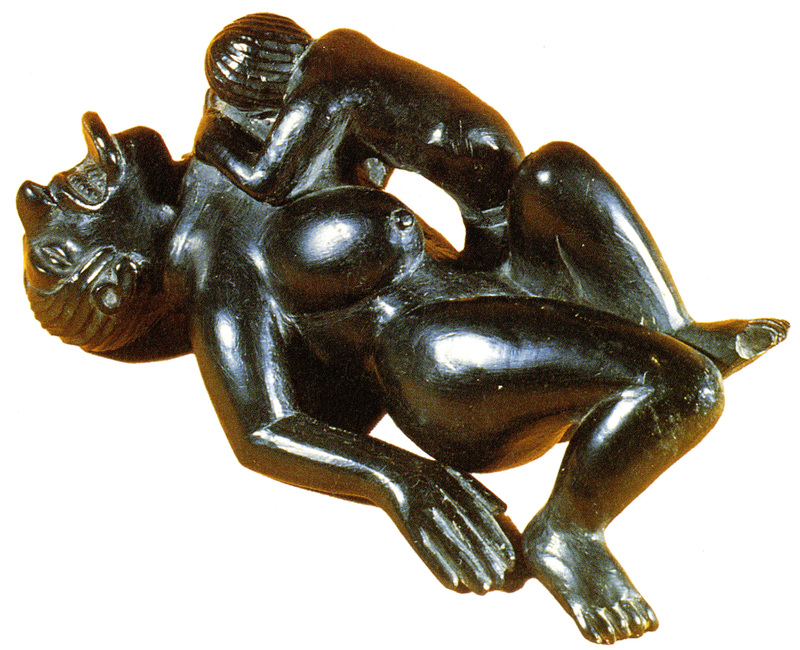 In one common story, a woman marries a bear and gives birth to twins (Figure 5). When her brothers find them, the bear allows himself to be killed to save the cubs. Before she and her children return with her brothers to be part her family, the woman conducts ceremonies to bring the bear back to life (Bieder 2005:56; 2006;168; Rockwell 1991:116-121). Figure 5: Contemporary native artists depict bear-human kin relationships. Bear as healers. Bear doctors are common in many Native cultures (Bieder 2006:170; Rockwell 1991:2, 64-67); bears are often depicted on pipes used in ceremonies (Figure 6), or healers wear bear skin (Shepard and Sanders 1985:99-103) (Figure 7). Most directly, this is because humans learned traditional medicine from watching bears self-medicate with gathered plants, many of which are now known by names including the word “bear” (Rockwell 1991:77). Furthermore, bears are seen as having life-renewing ability, perhaps because their hibernation is seen as a yearly pattern of death and rebirth (Bieder 2006:171; Rockwell 1991:5). These abilities are further highlighted in the marriage story told above and the hunting stories described below. 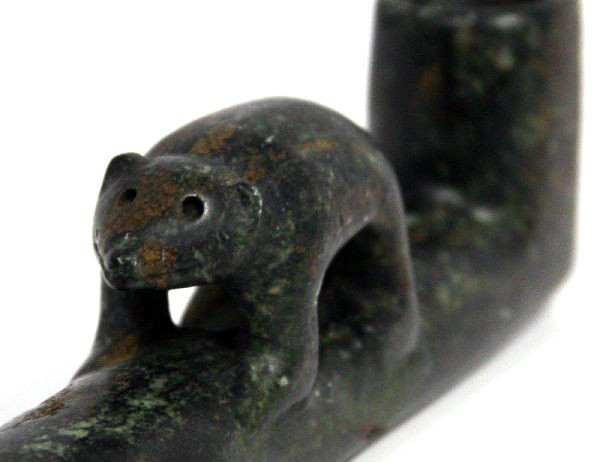 Figure 6: Hopewell period stone pipe depicting a bear. 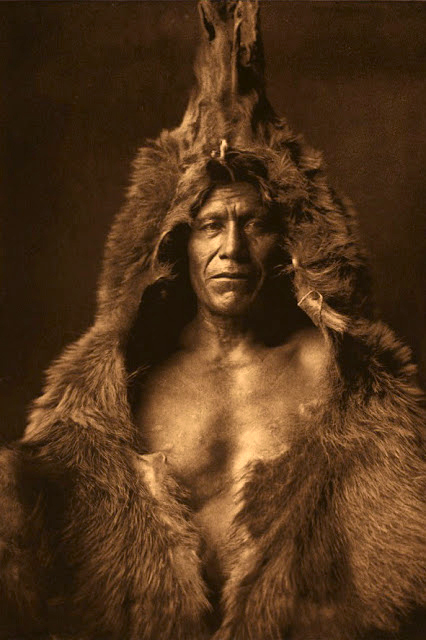 Figure 7: A 1908 Catlin photograph of an Arikara healer in bear skin. Bears as food providers. Bears are important game animals throughout their territory. That said, groups that hunt them see bears as very different from other prey. They are seen as giving themselves willingly to hunters because they do not cease to exist if treated appropriately after death (i.e., they are immediately reborn) (Black 1998:346; Rockwell 1991:26-27). It is imperative for hunters to follow all prescriptions about respectful treatment because bear spirits are thought to control all game animals and thus the success of subsequent hunts (Bieder 2006:164; Rockwell 1991:27). Some such rituals include killing the animal using only the most primitive tools (Hallowell 1926:34-35), pleading forgiveness upon death, making offerings of tobacco, consuming the meat at ceremonial feasts, and being attentive to the treatment of the blood and bones of the animal (Hallowell 1926:63-66) (Figure 8). In addition to providing themselves and other game as meat, bears guided humans in the collection of edible plants. Finally, stories often depict bears as producing food from their very bodies by rubbing their stomachs and producing nuts and berries or extracting grease from their fat without being harmed (Bider 2006:171; Loucks 1985:228, 238; Mooney 1900:327-329; Rockwell 1991:71-72). 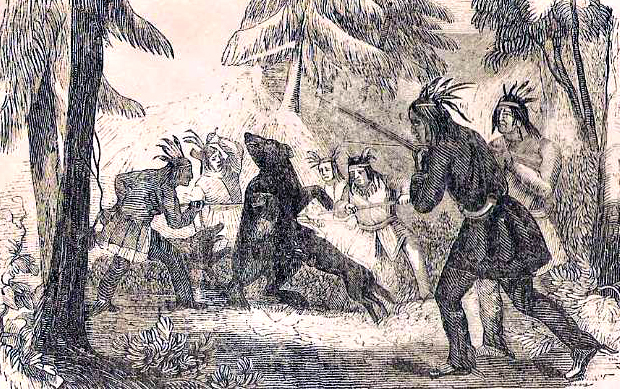 Figure 8: An 1856 engraving of Indians bear hunting with spears and dogs. Strong recurring themes connect the various roles played by bears and they may all stem from a small number of original stories (Black 1998:345l Hallowell 1926:153-157). The iteration of bear as food provider fits the evidence from Feltus particularly well. Foremost, Feltus is a site of feasting and the consumption of bear appears to have been more prevalent there than most prehistoric sites (as evidenced by bear bone in trash deposits). The rituals connected with these feasts are echoed in many of stories uncovered by this research: (1) pipes are consistently found in association with bear remains at Feltus suggesting tobacco smoking rituals like those in the literature; (2) fire, indicated by the ash lining the Feltus post holes, is essential to traditional postmortem prescriptions for bear blood and bones; (3) tall, standing posts like those in the southern plaza and under Mound A are used to protect the bones of slain bears in recorded ceremonies (Figure 9). Together these material remains—feasting debris including bear bone, ceramic pipes, and ash-lined post holes—align remarkably well with the traditional bear ceremonialism throughout Eurasia and North America. These findings not only help us to understand the origins and meaning of the activities taking place at Feltus, but also expand our understanding of the geographic and temporal extent of bear ceremonialism. Figure 9: Cree bear pole decorated with offerings. Note: Bears often serve the role of spirit guide and bridge this world with the other world. This is a topic that will be discussed in more depth in a SEAC paper to be presented in Baton Rouge… stay tuned! Bieder, Robert E. (2005) Bear. Reaktion Books, London. Bieder, Robert E. (2006) “The Imagined Bear,” Current Writing, 18(1):163-173. Black, Lydia T. (1998) “Bear in Human Imagination and in Ritual,” Ursus, Vol. 10:343-347. Hallowell, Irving. (1926) “Bear Ceremonialism in the Northern Hemisphere,” American Anthropologist, 28(1):1-175. Loucks, Georgina. (1985) “The Girl and the Bear Facts: A Cross-Cultural Comparison,” The Canadian Journal of Native Studies, 5(2):218-239. Mooney, James. (1900) Myths of the Cherokee. 19th Annual Reports, Bureau of American Ethnology. Rockwell, David. (1991) Giving Voice to Bear: North American Indian Rituals, Myths, and Images of the Bear. Roberts Rhinehart Publishers, Niwot, Colorado. Shepard, Paul and Barry Sanders. (1985) The Sacred Paw: The Bear in Nature, Myth, and Literature. Viking Penguin Inc., New York. This entry was posted in Ceremonialism, Ethnohistory and tagged Bear, Feltus, Post Ceremonialism. MEG KASSABAUM. This is AWESOME stuff! First and foremost, I want to point out that, for better or worse, this line made me smile: “Bears cry tears, they spank their children when they’re bad, they construct a dwelling, they eat the same foods in roughly the same proportions as humans—and even share our voracious sweet tooth.” Sweet tooth — heard that! Though you may have encountered these references already, I know they found some bear at the Middle Woodland Biltmore mound in ritual feasting contexts, where they are cited as “power parts” (see also Gathering Hopewell on that score). Also, I have yet to follow up on this study, but Bob Whallon told me that he encountered a boatload of bear feasting debris while working on Late Woodland Owasco stuff in New York. I am really intrigued by your pulled/infilled postholes. At Garden Creek, Bennie found sand filled posts demarcating a plausibly ritual structure under that platform mound, and more recently, we found river rock filled postholes in the filled-in ditch enclosure on the site, plus some posts inside the enclosure with fragments of mica at the base. Since these are all in non-domestic contexts, I’ve been thinking of these in terms of ritual closure — a concept that I’ve seen applied more in the Southwest than the Southeast, but that may nevertheless be relevant. What do you make of these features at Feltus? You’ve given me lots to think about this afternoon! Can’t wait to see the full manuscript and your paper at SEAC! Meg, this is spectacular. I, like Alice, was particularly fond of the line about bears crying tears and spanking their children. Well, Will and Alice, you two would have loved the other things I played with including in that sentence. Some authors focus heavily on masturbation and defecation when describing bears similarities to humans… I decided to spare you all the details. Alice, thanks for the suggestions of sites to look in to. I most certainly will as I develop these ideas into conference papers and a publication! One place I know I really need to expand is in my tracing of these ideas and stories through prehistoric southeastern and midwestern cultures in terms of their archaeological representations. I am fully convinced there is continuity in many of these ideas, but I need to be able to prove it. I am now convinced that I really need to look into Biltmore Mound. If I remember correctly, they have some non-structural posts I should look at as well. Posts + bears = a very intrigued and obsessed Meg. In terms of ritual closure… you’re right. I think this is EXACTLY what we are seeing at Feltus- the material remains of the end of a ritual cycle. Erin and I will be talking a bit about this in our SEAC paper in Victor’s ritual deposition session. To be honest, I am just getting into reading this literature, and I agree… much of it is coming out of the Southwest. As a teaser, one thing I am thinking about centers around the posts (and the materials deposited in them) being portals or bridges to other worlds. It would be dangerous to leave portals like those open when they were not being actively maintained, protected, or monitored. Thus, they must be closed in ritually prescribed ways before the site is abandoned again for a time. Let’s stay in touch regarding this as we both do more reading and be sure to share sources. Anyone else reading this… please share as well! Will, you make a really good point about the use of the word “trash” and I think I should have just given a bit more information. You’re right that “trash” at Feltus is likely not the same thing as “trash” elsewhere. My response to your comment is that: (1) the refuse deposits at Feltus are all feasting deposits, not domestic refuse; (2) no one was living at Feltus, but rather the site represents a place where people gathered for occasional ritual events. Therefore, depositing trash there may in itself be an appropriate way of disposing of ritual refuse because it is a special place on the landscape; and (3) my preliminary analyses show that even though all of the material is likely feasting refuse, the bear in the big refuse pit is STILL treated differently from the other faunal material in that it is not burnt while the rest of the animal bone is. For all of these reasons, I think the word trash was misleading… I will certainly remember to be more descriptive of these refuse deposits in the future!